One of my favourite holidays to start off the new year with is the Epiphany, for my family it's the Catholic holiday celebrating when the Magi arrived to Bethlehem to see the Christ (frankincense, myrrh, and gold included), or (if I understand it correctly) the day that the eastern Orthodox Christians celebrate their Christmas. 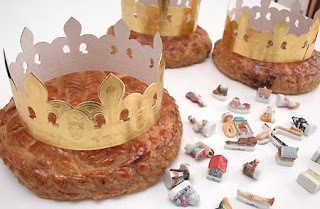 Aside from adding the Magi to our family's Nativity scene, the biggest tradition that I've only ever still seen celebrated in Europe is gathering up the family to eat the Galette des Rois (or 'King's Cake', though it's more of a puff pastry). A galette is a to die for frangipane pastry that contains a fève (literally a 'bean' but now usually a porcelain miniature). Tradition goes that the youngest person in the family sits under the table when the galette is brought out, and the family's patriarch cuts the galette into as many pieces as there are people present. The person under the table (and that gets to be me!) then calls out who each piece goes to. This goes on until everyone has been served. 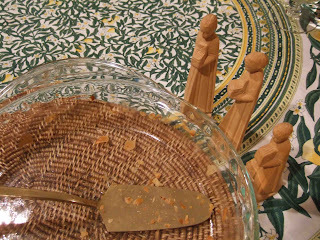 We then proceed to eat the yummy cake and whoever finds the fève in their piece is crowned King and gets to wear a silly golden paper crown and selected a Queen (or King). I find the bit about the 'Gâteau de l’Êgalité' really funny... I guess people have believed in the whole concept of renaming things (aka. 'freedom fries') for a long time now when they disagreed with current political times! It being a french puff pastry, you can imagine that a 'real' galette is filled with butter, eggs, and all sorts of non-vegan things. To adapt both the tastes for my family, especially for my dad, and trying to stick to as 'raw' ingredients as possible, I made my first galette totally from scratch today and I was actually more proud of it than any other recipe I've made in a while. I guess when you are trying to simulate such a historical recipe with such a remarkable and sought-after taste, the pressure is really on! Unfortunately, I didn't actually get to photograph my galette... That's how yummy it was I guess (see photo for proof... I think the Magi look dismayed that they didn't get any)! What I ended up doing was using phyllo pastry as the crust (the 'pâte feuilletée' you usually use for galette just can't be found anywhere outside of France). I placed these sheets in a pie plate, brushing every couple slices with Organic Earth Balance margarine (I used about 5 phyllo sheets). The frangipane was a mix of 1 C of almonds soaked overnight, rinsed and peeled the next morning, and dehydrate. 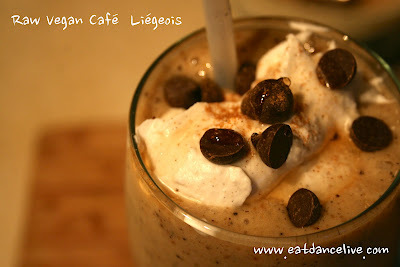 I then food processed the almonds with agave nectar, almond and vanilla extracts, and a pinch of salt. I smeared the frangipane paste into the pan (with the crust lining the bottom), stuck the fève inside, and folded the sides of the phyllo sheets back into itself (and added a couple sheets to make it look as round, pretty, and as much like a cake as possible). Gotta say, it ended up looking pretty to close to the picture of the 'real' galette I posted above. I brushed the top again with a little more margarine to make sure the crust would stick together and that it would get that pretty golden colour in the oven. I finished it off by baking it at 400F in the oven for 10 minutes and lowered it to 350F for another 20 minutes (goodbye raw! but oh well...). And there you go! Happy Epiphany! Why my galette of course! But also finished those eggplant bacon slices though they aren't very photogenic. I've also managed to make up a ground soaked flax-ground sprouted soybean-partially ground soaked sesame seed-maple syrup-cinnamon-dash of salt cracker which goes wonderfully with raw pb&jam! Triple kitchen victory for today!